There are twelve Oregon Trail markers in Washington, marking the Oregon Trail cutoff to Puget Sound. In Washington the Oregon Trail followed the Cowlitz River from Fort Vancouver to Cowlitz Landing, then went overland on a rough wagon road to Olympia. There are markers at Vancouver, Woodland, Kalama, Kelso, Toledo, Mary’s Corner, Centralia, Grand Mound, Tenino, Bush Prairie, Tumwater, and Olympia, the end of the trail on south Puget Sound. 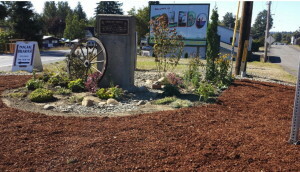 The trail marker pocket park in Toledo, maintained by the Daughters of the American Revolution, Sacajawea Chapter, has been restored and will be rededicated on September 27, 2016 at 1 p.m.